After you sign in to your account you will be taken to your "My Home Deliveries" page. From here there are a number of things you can do. Please note that all delivery changes must be made by 7:00 PM on the day before your delivery (the "cutoff time.") Certain delivery routes and products may have different cutoff times which will be indicated on the order pages. The "My Home Deliveries" page displays your upcoming deliveries. You can change the scheduled items with the "Add/Change Items" link. If you would rather skip service for that day use the "Skip Service" link. 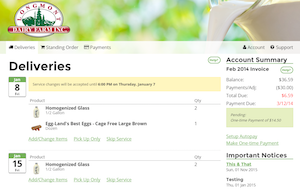 The "My Standing Order" page displays your standing order - the items you will receive each week, or less frequently depending on the options you choose. Use the "Change Standing Order" link to make changes. Any changes will be reflected in your upcoming deliveries, unless the cutoff time has passed for a delivery. You can view the balance of your previous invoice in the Account Summary sidebar on the My Home Deliveries and My Standing Order pages. This information will be updated as new payments are received or adjustments are made. Longmont Dairy Farm offers the convenience of auto-pay. Set up auto-pay and enjoy the benefits and convenience. Through the Account menu you can change your email address and password, set up a secondary user, or sign out of your account. Through the Support menu you can send us e-mail.